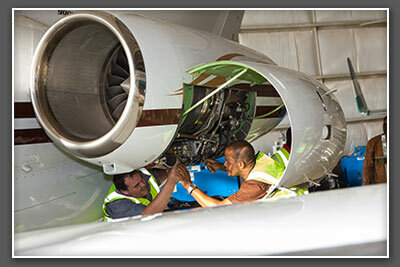 When SkyJet was initially conceived in 2006, the vision was to create a corporate aviation community with modern reliable aircraft, properly maintained, and professionally operated from a new fixed base operation in Kaduna, Nigeria. Our high quality hangars were purchased from a steel company on the West Coast of the United States. The facility was constructed by local Nigerian contractors. In 2009 we added our professional engineering staff that is comprised of licensed and trained Nigerian and ex-patriot aircraft engineers. With all this in place we applied for and received our Nigerian AMO. In 2014 applied for and received an AMO from San Marino in conjunction with having the ICAO form 83bis completed and signed by the governments of Nigeria and San Marino which gives us the authority to maintain our San Marino registered aircraft utilizing our Nigerian AMO. Our maintenance capability currently includes maintaining Embraer Legacy and Hawker Beechcraft products. However our capacity is unlimited and can be expanded. We are very desirous to include factory approved service centers for Cessna, Gulfstream, and Bombardier in the future. We recently expanded our maintenance by receiving Embraer factory approval to perform the L1 and L2 inspections on our Embraer Legacy. We also do all the maintenance up to and including the 24 month inspections on our Hawker Beechcraft. In addition to the investment in engineers, offices, workshops and related buildings, an extensive investment has been made in tooling, plant and equipment and a training center to safely and professionally take care of both our customers and our aircraft.